ca 525 - 515 B.C. Side A: Heracles and Apollo struggle over the Delphic tripod. 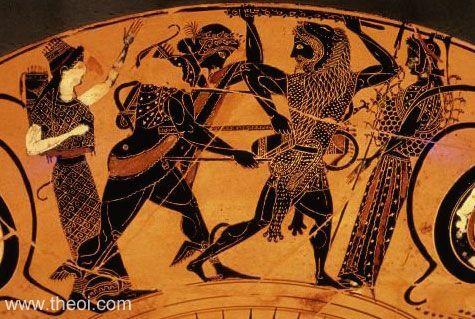 Heracles wears his lion-skin cape and is armed with a club. The god Apollo is depicted as a youth with a quiver slung over his shoulder grasping the club of Heracles with one hand. Two goddesses stand in support of each. On one side is Athena wearing the snake-trimmed aigis cloak and on the other stands Artemis with a quiver and crown. Side B: Heracles and the Nemean Lion (not shown).